I hadn't planned on doing a post today but I thought it might be nice to share this recipe I tweaked. Unlike some of the blogs I read, I am not a master in the kitchen! I love to cook though and try new recipes but everyday it seems I learn something new about food, baking, etc. so I am by no means an "expert". 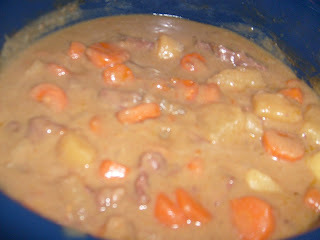 I have been making beef stew for years now but it just never seems quite right or something's always missing. I finally think I have a good one to follow! I never really make it the same way twice (kinda like meatloaf) but I think I will be following this recipe for years to come. I know this isn't the best picture but trust me, it's good! I coat the meat in flour and usually add a blend of garlic powder, seasoning salt and whatever else I have on hand. I'm not really sure if makes much of a difference though. I brown the meat in the oil on high heat just until slightly brown. Combine soups and broth with a whisk in your slow cooker. Add meat, carrots, and potatoes to cooker and cover. Cook on low 6-7 hours and enjoy! Oh yeah that's right Stacy. You don't like the yummy fungus! Well I'm sure adding cream of celery soup would still taste great, or cream of potato might also be good. My Bargain Buy- A 50 cent Purse!